Found another crib structure – alone on a hill top. Suppose it was convenient at one time to store ear corn close to where it was harvested. Peeked inside to see a sturdy set of “X” bracing of 2×12’s. 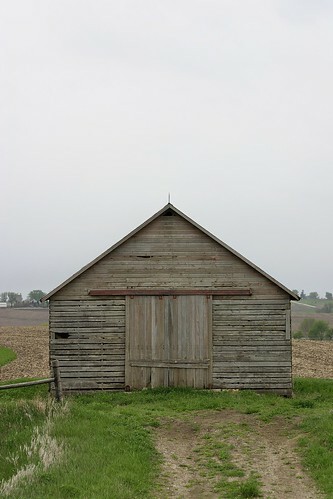 The sides of this one have horizontal flipper style doors at the bottom of the bins that would likely have been used to rake out the ear corn upon either feeding time or shelling. The structure appeared in generally good shape – good bones… skin weathered. Somewhat time worn but sturdy for years to come, pending no further attention, I’d imagine this old bruit will be around. Here in east central Iowa, the land is gently rolling – the landscape as depicted in a stereotypical portrayal like Young Corn by Grant Wood. This entry was posted in Documentary, Matt Niebuhr - Photography, Photography and tagged Cribs, Documentary, Iowa, Matt Niebuhr, Photography by Matt Niebuhr - West Branch Studio. Bookmark the permalink.